One of the most surprising ways of improving sleep is to reduce the amount of time given over to it. I have seen literally hundreds of patients who's lives are blighted by poor sleep, and yet for many of them a significant part of the answer could be a planned programme of sleep restriction! 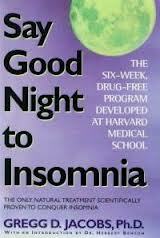 Of course this seems contradictory, but Harvard Clinical Psychologist Gregg Jacobs, explains why in his excellent book, Say goodnight to insomnia. He acknowledges that whilst many people with poor sleep patterns try to improve things by going to bed earlier, in the hope of getting off to sleep sooner, thus catching up on lost sleep, all this does is to exacerbate insomnia. By going to bed earlier all one does is to increase the amount of awake time whilst in bed which increases the bed as a stronger cue for wakefulness! 1. Reduce the time in bed so that it more closely matches the amount of sleep you are averaging (you may need to keep a sleep diary for 7 days first to determine that-he gives advice on his to complete a diary). 2. If you are only averaging 5 hours of sleep but are in bed for 8 hours, then reduce your time in bed to roughly 5 hours, by going to bed later, getting up earlier or a combination of the two. 3. Determine your maximum allowable time in bed by adding one hour to your average sleep time. 4. Reducing time in bed is only temporary until sleep efficiency improves to 85% (ie you are asleep for 85% of the time you are in bed). Once you reach 85% efficiency you can increase the time in bed by 15 minutes each week so long as you maintain the 85% efficiency. 5. If you find it hard to go to bed later whilst you are retraining then take a walk, do a household chore or a project for a few hours before your new later bedtime to ward off fatigue. If you watch tv all evening it will be harder to delay your bedtime. He has lots more advice in the book and of course there are many factors that can mess up our sleep (including our dear children! ), but I've seen many patients for whom sleep restriction has been a revelation and has completely turned around years of insomnia.